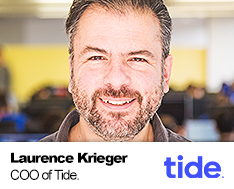 Laurence Krieger is the chief operating officer (COO) at Tide, the online current account for small and medium sized businesses. Krieger has more than 12 years of experience working in senior roles at fast-growing fintech start-ups. Prior to Tide, he was COO of Revolut, where he helped to rapidly scale the business from initial start-up to over 800,000 customers. He was previously founder and CEO of payment business Cobalt where he delivered high profitability and grew annual revenues to more than £100m. He launched one of the first prepaid cards into the UK with Moneysupermarket and has also held senior roles at Yahoo! UK and IE.